The Bike-sharing Blog provides information on the emerging public transport mode of bike-sharing. The Blog is provided by MetroBike, LLC, based in Washington, D.C., USA. The Shared Use Mobility Center (SUMC) and the North American Bikeshare Association (NABSA) joint conference had two very interesting Public Use Bicycling (PUB) products on display, both making their North American debut: The Velobility pedelec and the Blaze Safety Laserlight. Velobility, a Swiss producer of bike systems in service in Europe and the Middle East, showed its new SwissFleet pedelec. One of the most intriguing aspects of this bicycle is it has multiple methods for re-charging its electrical-assist motor. Not only could it be recharged at its conventional powered docking station, but also using a soon-to-be adopted universal EnergyBus connector made for all electric vehicle rechargers which are planned to be widely available in many cities. This could be a game changer. This bike improves upon Velobility's RIDEBOX which the Blog wrote about previously. This feature has an electronic self-contained locking mechanism, the electric-assist motor, battery, and all the electronics. There is an on-bike user keypad interface with RFID, NFC, and smartphone connections for easy operation. More importantly, it's a nice riding bike for PUB service! The bright spot of the new products was definitely the Blaze Laserlight fitted on a PBSC Urban Solutions bicycle. 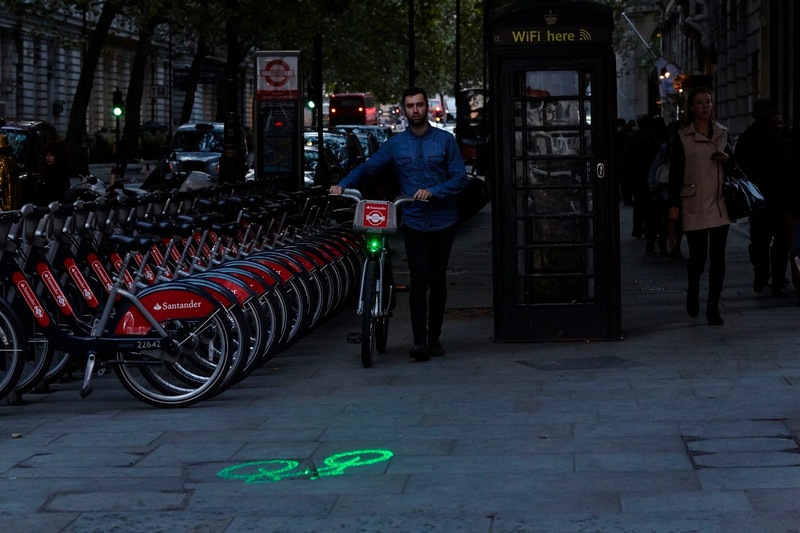 After a year long process, the developers of Blaze working with Transport for London (TfL) and their operator, SERCO, adapted this safety laser light for use on 250 Santander Cycles in London as a trial. 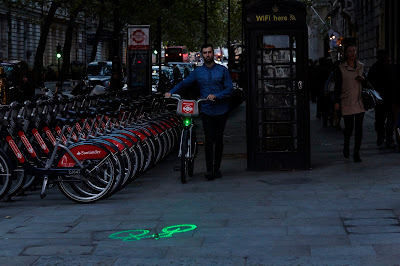 The laser light projects an image of a bicycle on the street 6 meters in front of the bicycle while it is in motion and at night. This makes both pedestrians, other cyclists, and motor vehicles take note of the oncoming cycle hire bicycle. All PUB systems should consider incorporating this device in their fleets. Stay tuned for more updates, including a report on the recent launch of North America's first municipal pedelec program. Plus a sneak peek of the end of the year data from The Bike-sharing World Map. If you didn't have a chance to make it to the Chicago Conference mentioned above, there is another event of great interest taking place next month at MIT in Cambridge, Massachusetts USA. MetroBike, LLC was founded in 2004 and is North America's first bike-sharing consultancy. MetroBike can assist your organization with your bike-sharing consulting needs. Contact MetroBike today. A Virtuous Cycle: Bicycling in D.C.
Will Smart Bikes Succeed as Public Transportation in the United States? Keep up-to-date with The Bike-sharing Blog by using our Blog's Google gadget. See Bike Share Philadelphia's video collection of bike-sharing services around the globe. Copyright (c) MetroBike, LLC. Picture Window theme. Powered by Blogger.